Burgundy had a challenging year in 2008, with lots of rain all summer. Fortunately for vignerons, dry and sunny weather in late September rescued grapes that, according to Jancis Robinson, many were thinking of not even bothering to pick. The cool temperatures throughout the year meant high acid levels, which might actually boost longevity. However, red wine producers in particular had a tough time getting their grapes ripe enough to deliver good fruit flavors. Frederick Wildman & Sons, one of the top Burgundy importers in the U.S., brought barrel samples from 8 Burgundy producers to San Francisco this week for a preview tasting. Few of the wines are available right now, but they give a good snapshot of the vintage. * Whites are generally better from '08 than reds. * In particular, whites that are usually fleshy -- Puligny-Montrachets and Meursaults -- seem to benefit from the intense acidity. These wines are drinking well enough now but might continue to develop for a decade or more. * The producer really, really matters in '08. Wines from Maison Olivier Leflaive in particular were strong across the board. * Fabien Moreau (Domaine Christian Moreau winemaker) thinks Chablis actually had a good year in '08, with plenty of richness and good minerality. I didn't taste enough Chablis wines to comment, but I will stipulate that he knows more about it than I do. * Some producers were able to make good village wines, but the ones I liked weren't cheap. * Despite the world wine economy, '08 does not seem like a good year for bargain-hunting in Burgundy. I'll see if I can find a few at a much larger tasting next month, but in the meantime, if you're pre-ordering, don't stock up on the cheaper ones. Before the tasting notes, a note on pricing: I only have the wholesale price in California, not suggested retail. I'm going to assume that wines will sell for about 1.5 times wholesale bottle (not case) price. Please be advised the prices I'm listing are estimates based on that. This is winemaker Franck Grux's 19th vintage at Leflaive, and he is much more involved than the usual negociant. Rather than buying finished wines, Grux vinifies grapes himself from many appellations. The winery also owns 30 acres of vineyard in Puligny, Chassagne and other areas, giving them an unusual amount of control. In 2008, this was a huge advantage. These are highly allocated wines, and this truly was a sneak preview as they won't be sold to retailers and restaurants until 2011. They're worth noting because as a group, these were the best red Burgundies I tried. 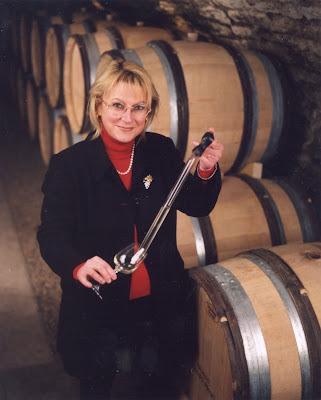 In 1997, winemaker Nadine Gublin (that's her in the photo) was the first woman elected Winemaker of the Year by the Revue du Vin de France. She believes that organic viticulture -- as well as the late warm spell -- helped save her crop in '08, because she watched the sugars rise before the flavors ripened. When she finally started picking on Sept. 28, she ordered the crews to finish in a hurry, and they did, picking the Pinot Noir first and the Chardonnay after -- which might account for the fact that at this point the whites are ahead of the reds. Winemaker Fabien Moreau told both Stephen Tanzer and Allen Meadows that '08 was excellent for Chablis, with concentrated sugars and acidities for great richness and minerality. If he's right, and he might be, I might be scoring these wines a little on the low side, because good Chablis will definitely taste better 5 years from now. One thing is for sure -- these wines are not models of restraint. One of the best properties of the Antonin Rodet empire, Perdrix has 25 acres of holdings in the Cote de Nuits. The largest producer of white Mercurey has plenty of vineyards to choose from, and that's an advantage in a troublesome year like 2008. Unlike much of Beaujolais, winemaker Stephane Aviron eschews carbonic maceration in favor of traditional fermentation, just like the rest of Burgundy. He takes his wines seriously and you should too. Most wines from Pouilly-Fuisse are blends from different areas, but owner/winemaker Jean-Jacques Vincent prefers to highlight the terroir of individual regions. Even though I didn't love all of the wines, they are all very different, and that's interesting. A joint project of Antoine and Jean-Jacques Vincent, affordable wines made from purchased fruit -- but with control over the vinification that probably saved them in 2008. Good value. For me, Domaine Armand Rousseau makes, year in/year out, some of the best wines in the world. I wish I has been able to taste the barrel samples for 08. It is always interesting to me how the oak resolves itself after a few years.